PeaceHealth Rides offers a healthy, convenient and fun way to explore your community. To get riding, choose the membership plan that works best for you. 10 cents per minute after the first 15 minutes, prorated by the minute. Choose this plan *Prefill of $2 is required to validate credit card and will be applied as ride credit to your account. Includes 60 minutes of ride time per day. Additional time is billed at 10 cents per minute. * Free month promotion runs through May to celebrate Bike Month. Promo code expires 5/31/19. Includes 60 minutes of ride time per day. Additional time is billed at 10 cents per minute. Payments are non-refundable once you ride. Bikes can be parked at any public rack or other permitted bike parking. There is a small **$1 fee** for bikes parked outside a hub. Receive **$1 credit** for returning a bike to a hub. You are not limited to riding within the confines of the system. As long as you bring the bike back into the system and lock it up there is no additional charge. Choose your plan and sign up for a PeaceHealth Rides membership through the website or mobile app. To end a ride, just lock your bike to any hub. Or, lock it at a public bike rack for a small additional fee. While you don’t need the app to use the system, download the PeaceHealth Rides mobile app for an enhanced experience! PeaceHealth Rides is a network of bike share stations, where users can pick up and drop off publicly available bicycles for one-way trips across the city. These bikes are smart and sharp, with GPS tracking and built-in safety features – so you can roll with confidence on a bicycle built for you. Bringing bike share to our city expands transportation options for our residents and visitors at a low cost. PeaceHealth Rides is integrated with our transit system and won’t cost the people of Eugene any money to maintain. Building quality public transit is essential to building a city for the ages. PeaceHealth Rides is a partnership between the City of Eugene, University of Oregon, Lane Transit District and Social Bicycles by JUMP Bikes and is sponsored by PeaceHealth. JUMP Bikes has been shaping the future of bike share since 2010 from its headquarters in New York City. In 2013, JUMP Bikes launched Social Bicycles, the first dockless bike share system in the U.S. fitted with “smart-bikes” that integrated GPS, payment systems and locks directly onto the bikes themselves. To date, over 15,000 bikes have been deployed in 6 countries across 40 markets and have clocked over 5 million rides. In 2017, the company launched, JUMP, the first dockless electric bike share system in the U.S.  Learn more about JUMP Bikes and its Social Bicycles solution at jumpbikes.com. PeaceHealth Rides and the City of Eugene are committed to accessibility. Adaptive Recreation Services at Hilyard Community Center provides year-round, community-based recreational, social and educational programs for Eugene area children, teens and adults with disabilities. More information about adaptive bike equipment available for rent can be found here. For reasonable modifications, or other accessibility services, please contact customer service at (541) 214-2212 or support@peacehealthrides.com. PeaceHealth Rides give you access to hundreds of bikes around town. Use them to commute, run errands, visit friends or just for fun! Learn about riding, billing and your account with these FAQs and help pages. No, you can lock the bike at any approved bike rack in the system area. These are identified on the map on the website and the app. Learn more about going for a ride. What if someone checks out my bike while I'm grabbing coffee or grocery shopping? That is a possibility – if you forget to use the “HOLD” feature! Just push the “HOLD” button on the keypad on the bike before you lock up. The bike will be reserved in your name for an hour, and no one else will be able to check out the bike. It’s perfect for running inside to grab coffee or a library book. Learn more about going for a ride. Does the time roll over if I don't use it? No. Use it or lose it. One hour a day is included with membership; you can take as many trips as you like that add up to 60 minutes. If you’d like to keep riding, it’s just 10 cents a minute for additional time. Learn more about account management. How do I know the bikes are maintained and safe? PeaceHealth Rides bikes are as tough as any bike on the market with smart-design safety features built in, to lower risks of injury or theft. Bikes are cleaned weekly and inspected for maintenance needs. Users can report any bike issues by pressing the “REPAIR” button on the bike. PeaceHealth Rides bikes have GPS tracking and remote locking capabilities, front and rear safety lights and an eight-speed internal hub. Only if they are at least 18 years old, and can safely reach the pedals and the hand-brakes while seated on the bike. They must pilot their own bike – no doubling. Can I rent multiple bikes on my account? You are able to rent up to six bikes on one account. Please note, free time applies only towards the first bike unlocked. 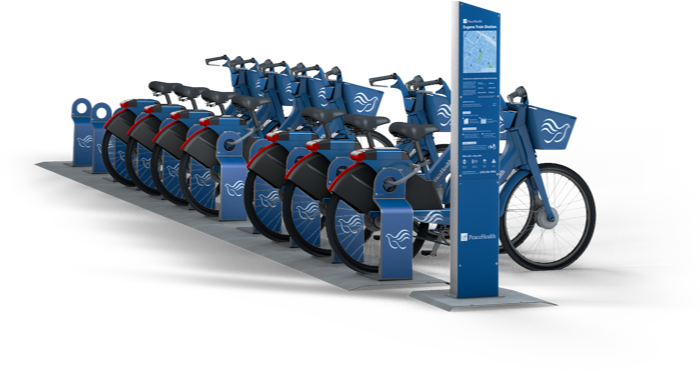 All other bikes will be charged at the normal usage rate of $0.10 per minute plus the additional $1 rental fee should you select the Single Ride Plan. I heard monthly memberships are free to celebrate May is Bike Month. How does it work? New and existing users on the monthly payment plan can ride for FREE up to one hour each day for no charge! Monthly members use code BikeMonth19 to get a $15 credit added to your account. University of Oregon Monthly members use code UOBikeMonth19 to get a $5 credit added to your account. You’ll receive a free hour each day and additional time will be billed at 10 cents per minute. Promo codes expire 5/31/19. What if I’m on the single trip plan, how can I ride for free in May? The single trip plan is not eligible for free ride time. Users who would like to access free rides in May will need to switch to the monthly membership plan by logging into their account. Click here for step-by-step details of how to change your payment plan. You must log in to your account and add the promo code from the Memberships tab in-app or through the website. You can find more instructions here. First, double check that the promo code was spelled correctly and that you are redeeming the correct promo code for the monthly plan. If you continue to experience issues, contact our support team at support@peacehealthrides.com or 541-214-2212. Yield to pedestrians. Stop at all red lights and stop signs. Ride in the direction of traffic. Use the grip bell to signal your presence. Do not wear more than one earphone while riding. Obey traffic laws at all times. Plan your route before you ride to follow the safest route to your destination.  You can use our app to find your way to a bike you’ve reserved or to a hub when you want to end your ride. Check the bike’s tire pressure; try the grip bell; and if you’re riding at night, check that the front and rear lights are illuminated. Make it easy for the traffic around you. Don’t make unexpected turns that put yourself and others in danger. Ride at a steady pace so other vehicles can anticipate your movement. Whenever you ride, wear a helmet. Always buckle the strap. Replace your helmet after any crash and whenever you see signs of damage. 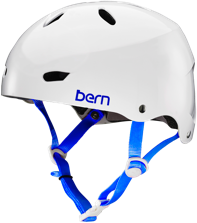 Every member is eligible for a 30% discount on professional BERN Helmets purchased online. New members receive a welcome email that includes a BERN discountcode after joining. Using PeaceHealth Rides is easy, watch the video! PeaceHealth Rides – Eugene Bike Share is powered by JUMP Bikes. Find bikes using our app!